The Bosu Ball is a great tool to perform many killer abdominal exercises! Because the Bosu Ball is unstable, your abdominals and core muscles will work harder, and you'll have improved balance, coordination, and core strength. 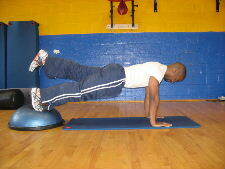 Below are pictures of 2 1 leg plank variations with the feet on the Bosu Ball. Form: While keeping your abs engaged, slowly lift one leg off the Bosu Ball. Hold the leg in the air for 10-30 seconds and then switch legs. Personal Trainer Tips: You can do this exercise in three ways. You can do 5-15 repetitions on one leg at a time-- lift one leg hold for 1 second and then return to the starting position. Then, simply lift that same leg 5-15 times before switching to the opposite leg. You can also do this exercise in alternating fashion, switching from your left to your right leg for 5-15 repetitions on each leg. Lastly, you can perform this ab exercise as an isometric exercise. Isometric simply means same length, so you would just lift one leg and hold as the instructions above explains. Starting Position: Begin this exercise in the same position as the isometric variation above, except hold from your elbows instead of your hands. Personal Trainer Tips: Remember to build up your strength by mastering the regular floor plank first. Then progress to the Bosu Ball for planks. Once you master 1 Bosu Ball, then try using 2 at the same time for a killer ab workout. 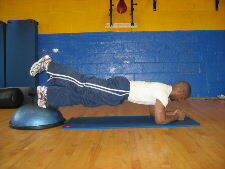 Core Training is great for everyone-- athletes and non-athletes. Core training is more than just making up crazy exercises. 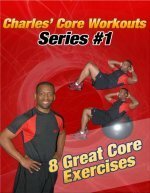 Lastly, visit the Picture Directory of Abdominal Exercises to learn more killer abdominal exercises and core exercises or try one of the free ab workouts.